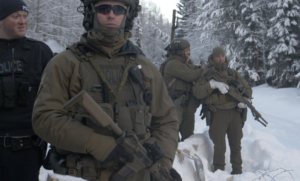 Heavily armed RCMP officers prepare to take down a Wet’suwet’en checkpoint. It has been a dramatic month in the snowy woodlands of northern British Columbia. In a remote area known to its Indigenous population as the Yintah, or sacred territory, construction of a three-story healing center is nearly complete. This off-grid facility is a powerful step forward for the local Unist’ot’en people. The healing center will serve those in need with a unique form of treatment that combines therapeutic services with renewed ties to ancestral lands and traditions. Allies and Unist’ot’en people gather in a circle before each meal at the Healing Lodge. The healing lodge has been built with donated money, materials, and labor. It represents a new and promising model for Indigenous healing. And it is under direct threat right now. I care deeply about that threat. To me this is not an arcane argument over some remote territory. I have made three trips to the Yintah, at roughly 800 miles each way from my home. I have wandered off trail through the forested hills of the Yintah. I know its beauty and remoteness. I have worked hard to help build the healing center, and I have donated funds to help in its creation. I have made friends there, with both settlers and Wet’suwet’en people. I have scraped beaver hides, camped in the snow, and cut spruce logs for porch-posts. I have seen the abundant wildlife of the Yintah, and I have sensed its vulnerability to a massive petroleum pipeline. As I write, crews from Coastal GasLink, a subsidiary of Trans Mountain Canada, are trying to push their fracked-gas project through the Yintah without the authorization of Wet’suwet’en hereditary chiefs. The threat led Indigenous residents to erect checkpoints across the only access road. 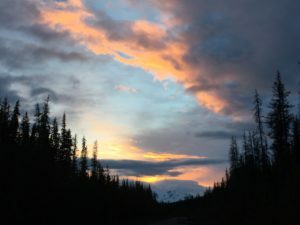 For nearly ten years, the Wet’suwet’en have protected their Yintah and their healing center by limiting access to these lands, only allowing in those who are committed to Indigenous rights. The hereditary chiefs of the Wet’suwet’en know how special the Yintah is. They recognize that fossil fuel infrastructure threatens not only their territory but the well being of the entire planet. And they are consistent and unified in their opposition to the Coastal GasLink pipeline. 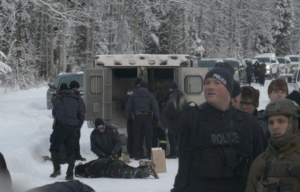 RCMP forces take down unarmed defenders at the checkpoint on 1/7/19. But on January 7, 2019, SWAT teams of heavily armed RCMP officers, backed by snipers and helicopters, stormed a checkpoint leading into the Yintah, aggressively arresting 14 unarmed defenders, including tribal elders and settler allies. A second checkpoint blocked the road a few miles further up. 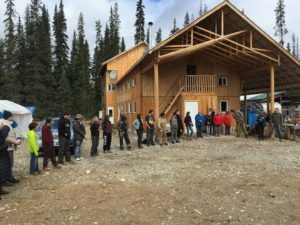 But fearing further violence, the Wet’suwet’en negotiated an agreement with the RCMP: The Coastal GasLink surveyors could enter their lands for surveying purposes only, not for construction. The RCMP could also enter, but would not seek to control access by any Indigenous people or their allies. 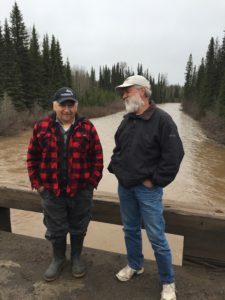 The elders entered into this agreement knowing that a 1997 decision by the Canadian Supreme Court upheld Wet’suwet’en land rights, and that over time those rights will prevail in court. Defenders insist that court-mandated protocols requiring free, prior, and informed consent of Indigenous peoples be honored. 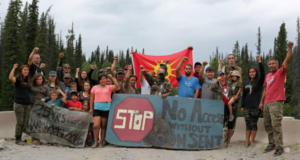 However, the RCMP promptly violated the agreement by setting up their own checkpoints and restricting access to and from the Yintah by Indigenous people and their allies. And Coastal GasLink promptly violated the agreement by initiating construction activities and destroying Indigenous cultural sites. This is where things stand now: In 2019, the rights of Indigenous people are being trampled by an unsavory alliance of government and business interests. The natural world, including the global climate, is being damaged by further expansion of fossil fuel infrastructure. And the RCMP and the judge who signed an injunction allowing this invasion are on the wrong side of the law. In sum, the tragic 150 year pattern of subjugation and violation of Canada’s First Nations is still being played out. The author speaks with Knedebease, hereditary chief of the Unist’ot’en, one clan of the Wet’suwet’en First Nation. How is this possible? Why woudn’t officers of the law respect the clearly established legal status of the First Nations group that have occupied these lands from time immemorial? In the year 2019, have not the European settlers to North America learned from past blunders and injustices? The answer is complex, but it is rooted in the immense financial and political power of the fossil fuel industry. It takes form in a government that pays lip service to reconciliation and environmental values while lending its power to savage attacks on the land and the people of the land. The only thing that can stop the crisis in the Yintah is people demanding justice. 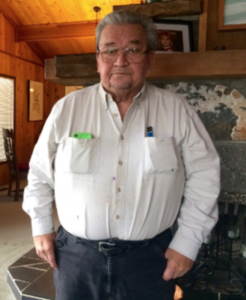 Earl Muldon, known as Delgamuukw, was the named plaintiff in Delgamuukw v. British Columbia. Fortunately, the Delgamuukw v. British Columbia decision of 1997 presents a strong and clear precedent for Indigenous rights. 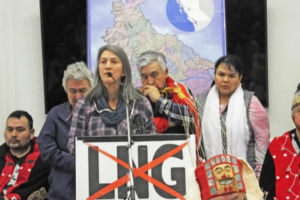 In that case, elders from the Wet’suwet’en and Gitxsan First Nations pursued a court declaration of their territorial rights after the Province of British Columbia refused to honor them. Given that no treaty was ever signed ceding these rights, and that no military action occurred to sieze them, Delgamuukw sought to clearly establish those rights. The wild beauty of the Yintah at sunset. It is only the power of the fossil fuel industry, including its dark ties within the Canadian government, that is preventing the right application of Delgamuukw in this current case. And it is only the power of citizens everywhere raising their voices that will compel Canadian courts to stop the invasion of the Yintah. Might yours be one of those voices? While we may never be able to right the wrongs of the past, we can certainly right the wrongs that are taking place right now. If we act. For ideas on how you can get involved, click here. I’m also following and supporting R.A.V.E.N. based in Victoria, BC, which helps to provide legal support to First Nations’s cases in Canadian courts.